For many people, the most important consideration when making any important purchase for the home is budget. However, whilst it is natural that how much you have available to spend will affect your buying decisions, price alone is not always the only thing that matters. If you are looking for a new garage door, here are some key things you should also think about. Your home is a place that you are proud to call your own, and no doubt you have invested a lot of your hard earned money to create that special place and add your personal touch, both inside and out. 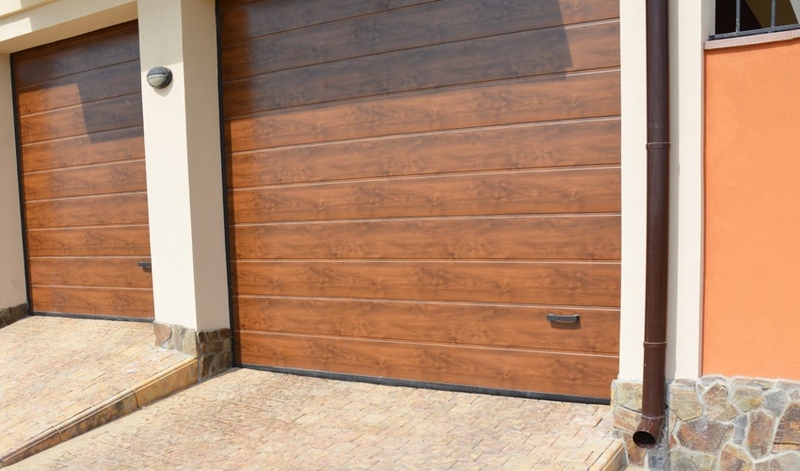 So when you decide to invest in a new garage door, it is really important to consider how it will fit in with the style of your home and its surroundings. Are you happy with a traditional white steel door, or do you think that your property deserves something more discreet, or perhaps the visual appeal of a wood finish? At Arridge Garage Doors, we supply a huge range of styles and types of door, meaning that you’ll always be able to find something that looks perfect. We offer a wide range of contemporary colours and finishes, as well as the traditional classics. We’ve even had a bespoke design featured in the finals of Grand Designs House of the Year. Often, the type of garage doors you install will be dictated by the interior and exterior space available. Up and over garage doors tend to be the best option where both interior and exterior space is limited. Both canopy and retractable doors require a limited opening area in front of the garage. 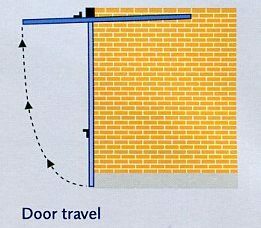 Although each type opens slightly differently, it is typically advised to allow at least a meter to safely accommodate the swing of the door and the person opening it. A third to a half of the height of the door is recommended. The mechanism for up and over doors is very compact, but bear in mind that they still need space at the side or overhead to house mechanisms and machinery. This is particularly important with smaller tunnel style garages when using a retractable door. You’ll generally need to allow 40-75 mm clearance on either side for the hinging mechanism, depending on the make. Hormann and Garador doors are available with retractable mechanisms which are specially designed to maximise drive through width on small single doors. If you have more overhead space available or have a larger entrance, then you may find that a roller door is a practical and attractive alternative. They are available with both manual and electric operation and come in a variety of colours and finishes. 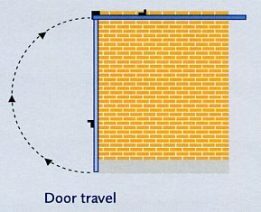 Where there is a need to maximise the space directly in front of your garage, for example if you have a limited amount of driveway space, a sectional door can be a good alternative to an up and over, as it does not require space in front of the entrance to open, instead opening on a vertical plane. Finally, if you have sufficient space, you may also wish to consider side hinged doors. Benefits of side hinged doors include suitability for certain styles of building, for example those built in the 1950’s, along with reasonable security and high durability. They are also available in made to order dimensions. Whatever you choose to use you garage for, security is a key concern. Although originally intended to provide protection for cars, many modern garages are used as additional storage, utility rooms, workshops and more. Some are even turned into offices or tool lockups. Whatever you choose to do with your garage, you want to be sure that it is safe and secure at all times. There are two main considerations when it comes to security – the door itself, and the locking technology. Choosing a garage door from a leading brand such as Hormann, Woodrite or Aluroll will allow you to buy with confidence, and ensuring the door is professionally fitted by experts will ensure that there is no doubt when it comes to security. Consider choosing a model that is certified Secured by Design (SBD) – Hormann, Garador and Aluroll all offer SBD certified doors within their ranges. Such doors include a range of enhanced security features such as multi-point locks, reinforced gussets, anti-drill barrels and more to give you total peace of mind. Where security is the main concern, it is worth noting that a sectional door is more secure than an up and over door as there is no gap at the side. Where high security doors are required for a specific application such as pub store rooms, motorbike lock ups, etc. it is worth considering Bradbury steel doors which are available as personnel doors or as double width door sets. If you have specific security related questions, we recommend that you get on touch with one of the experts here at Arridge Garage Doors who can talk you through the best solutions for your exact needs. To find your perfect garage door at the best possible price, get in touch with the team at Arridge Garage Doors today on 01691 670394 or click here to contact us online.